A young Burmese boat handler bedaubed with essence of goat testicle in a bid to stave off skin cancer. 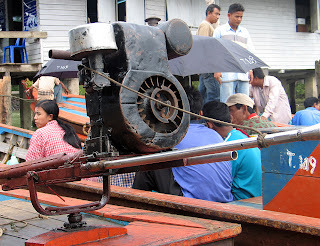 These are the engines of choice that power the long boats back and forth across the Andaman sea. I think they are small car engines, although I couldn't tell you from where they originate? They are as loud as hell and are without any form of carburation or silencing. 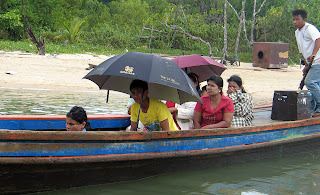 A 'long boat' takes people too and from the Burmese boarder. Many of these people are illegal immigrants and don't seem too happy to have their picture taken. There were many of them locked up at Thai immigration as they had just been caught crossing illegally.